In the 1960’s back boilers were common sights in almost every household. Today as people install more modern boilers, back boilers are slowly becoming rare sight. Finding the same make of back boiler for replacement of your old back boiler system can be a bit challenging. Despite this, back boilers still retain their reputation of reliability and durability. During the last ten years great improvements have been made towards the efficiency of back boilers. New systems such as the Baxi Bermuda System, have reduced the amount of space required and improved the energy efficiency of the system. If you are like most people, you probably take your gas back boiler for granted until the cold season comes around. Of course it provides you with hot water even in the warm summer days, but its greatest impact is felt in the cold winter days. Many people do not even realize that their homes have been installed with gas back boilers. How much do you know about that all important piece of household furniture hidden behind your fireplace? The Health and Safety Executive (HSE) has published several concerns regarding solid fuel back boilers. Several changes have been made to the building regulations that make it possible to replace an existing back boiler with another one but not to install a new back boiler where there was none. As a result of the warnings many people have developed fear towards gas back boilers. These fears are unfounded. They are a direct result of inadequate information. There’s nothing in this modern world that does not come with risks. Having adequate information from the right sources can help you avoid the risks of anything, even gas back boilers. Many home owners and tenants are opting to have their solid fuel back boilers replaced by gas back boilers. This is a wise step as gas back boilers are just as reliable and are even more efficient than solid fuel back boilers. Replacing your solid fuel back boiler with a gas back boiler is a much simpler option than replacing the whole system with a new boiler as you can simply use the existing pipe work. Gas back boilers work in a similar fashion to solid fuel back boilers. 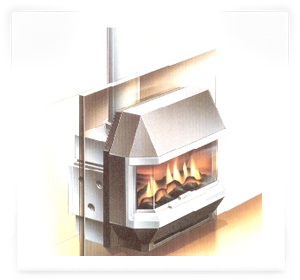 Modern gas back boilers such as those manufactured by Baxi Bermuda are placed behind fireplaces in the living room or any room of your choice. When the fireplace is lit, a water jacket is heated. The heated water then flows through the boiler pipe work. This heated water heats radiators placed strategically around the house. Gas back boilers are able to heat several radiators simultaneously thus providing adequate heat to your entire house on those cold winter nights. Although gas back boilers do not provide a high pressure hot water supply, back boilers can supply hot water to several taps simultaneously. Unlike with other boiler systems, the supply of hot water to one tap is not interrupted by turning another hot water tap on. Solid fuel back boilers are not quite as energy efficient as gas back boilers. Because of their energy efficiency, investing in gas back boilers is cost effective in the long run. Your heating bills will reduce significantly. In this day and age of economic hard times, this is great news. Just because you are saving money does not mean you can’t have a good looking house. Modern gas back boilers come fitted with fire fronts. There are several models from which to choose from. Most of the designs are modern and stylish. You even have the option of changing your fire front if you want something different. Regular maintenance by a qualified technician like Gas safe registered engineer like us is necessary for any gas back boiler you may have installed.